The American middle class faces an uncertain future. Staring headlong into a difficult – and changing – world economy that has yet to fully recover from the Great Recession, many middle class families are trapped between low, stagnant wages and an increasingly expensive set of social and economic supports. A social contract of basic services and economic protections is needed to support workers amidst the ups and downs of a volatile wage labor economy. Ensuring affordable access to these basic goods and services for all Americans complements wage increases in boosting living standards and sharing the gains of growth across the population. Yet wages and incomes for many workers are barely growing or even declining. Real household income is at the same level as it was in 1995, and the labor share of income has declined nearly 15 percent since the end of World War II – the result of policy decisions, technological and geo-economic changes, and the transformation of workplace norms and business models. Meanwhile, although certain material goods have become cheaper over the years, the costs of the key elements of the social contract have not. Prices for health care, higher education, retirement, and other necessities have steadily increased for individuals, who now also bear more responsibility for paying for them. Toasters and computers may have shifted from luxury goods to standard household items, but a safe retirement, an affordable postsecondary education, and more are moving further out of reach. The amount we spend on these programs stands out, but the benefits we enjoy do not. 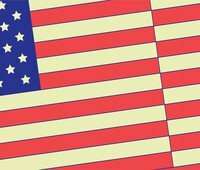 The US pays twice as much as a share of GDP on health care than the average of peer countries for the same or worse health outcomes – despite having the largest GDP in the world. The US spends more than anywhere else for higher education, yet is falling behind in how many students we educate and the academic quality of many of our colleges and universities. The US has a high cost of basic banking and retirement services, yet most people face ever more uncertain savings and retirement pictures. And even the Internet, which has become more central to both civic and economic life, is more expensive in the US than in many other OECD nations but looks like a tortoise compared to many comparable systems around the globe. According to the 2014 Social Progress Index, the US ranks 36th in the world in “foundations of wellbeing” – a catchall that includes education, health, and information services. Taken together, many of America’s domestic social and economic programs cost more money than those of other peer countries, yet we get worse outcomes and have less universal access. In other words, we pay more, but get less. Effective design is crucial to making these programs affordable and efficient for all, especially in the context of a difficult economy, but the current structure of many American policies has instead contributed to high and rising costs. 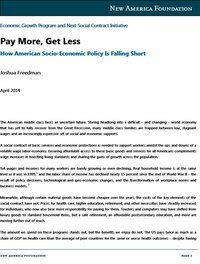 The pattern of “pay more, get less” is not reserved to any one part of the social contract – it is a pervasive feature of the entire American economic and social policy landscape. And this costly pattern has become a roadblock for expanding key policies to improve the quality of life for the majority of Americans.